Ok, first of all: the only reason why I’m writing this in English is the fact that I’ve never come across a nail blog that was written in Italian, so the only accurate polish-related vocabulary I have is in English. I’ve been reading this blog for ages, but the idea of using up my cherished (and, in some cases, pretty expensive and/or hard to find) polishes to try and create something new didn’t appeal to me. 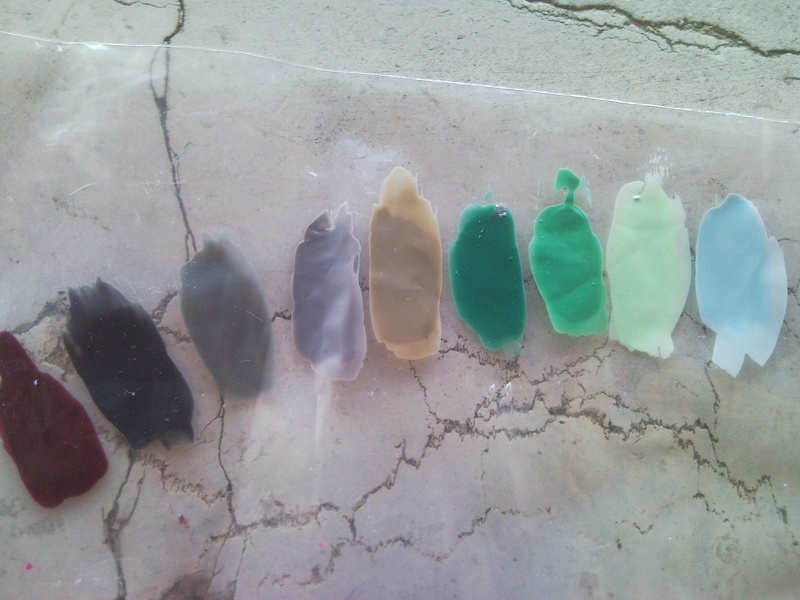 Moreover, I’ve never been that good when it comes to handling colors, and I’m a bit of a messy girl. I simply assumed that I would have come up with something hideous, and decided not to waste any money on it. 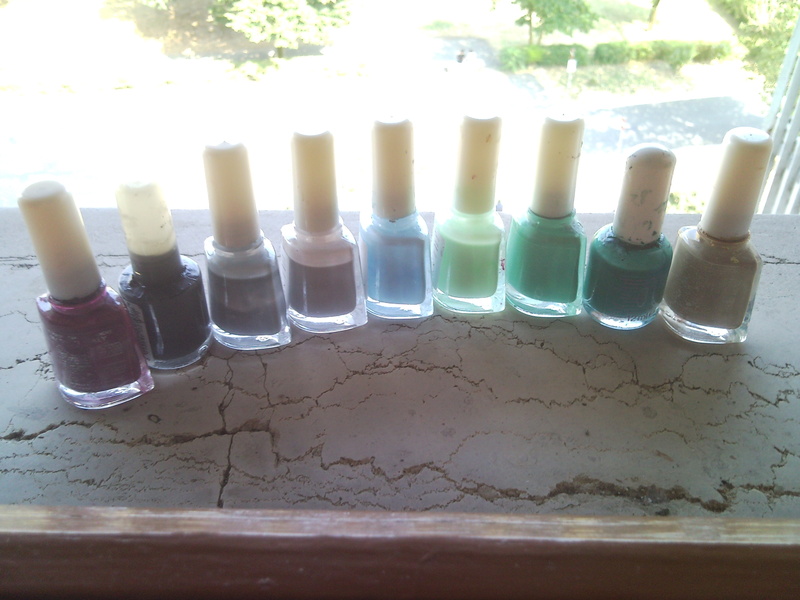 Then, last week, I came across some pretty cool extra-cheap no-brand polishes (1,50€ each!) which come in a zillion different shades. I bought LOTS of them, and while swatching I found out that there were a few of them which were too lovely to pass up the opportunity to wear them the way they are (a couple of gorgeous reds, a nice berry shade), some that were just plain (blacks, whites, a few pinks) and A LOT of them that were lovely shades, but had zero opacity, or were simply too bright to be worn alone. So I headed back to the store, grabbed a bunch more whites and clears and started having fun! The colors I created are all meant to suit my complexion, and believe me they do. Some of them are not really meant to be used in the summer, but I really love them all, and will be wearing them very often from now on. She Was Hot – Deep fuchsia shimmer. Undercover Of The Night – Dark grey with lilac shimmer and a hint of brown. Wild Horses – Blueish silver shimmer. In Another Land – Baby blue neon. Respectable – Apple green creme. Beast Of Burden – Muted green creme. Rocks Off – Bottle Green Jelly. Far Away Eyes – Camel shade, with a subtle shimmer. Here’s what they look like swatched on a piece of plastic (due to the present state of my nails, I’m not going to show them to you); as soon as my nails grow back I will update this post with pictures of my polishes “in action”. Believe me, this picture does not do the shimmers any justice – wait ‘til you see them on me! Questo articolo è stato pubblicato in Cose Gelatinose e contrassegnato come angie, beast of burden, dyi, far away eyes, frankenpolish, in another land, kost, nail polish, nails, polish, respectable, rocks off, she was hot, some girls, undercover of the night, wild horses da Jules Dufresne . Aggiungi il permalink ai segnalibri. comunque vedi bene, non tutti sono così opachi, anzi! però bei colori, brava bimba! Lo so che non sono tutti opachi, anzi! La maggior parte di quelli che ho preso sono dei coloracci fluorescenti pazzeschi, che mischiati con il bianco danno un risultato carino (IMHO). Comunque brava brava, good job! ah e grazie per il link, i miei smalti stanno già tremando!